1. The spiral has three and a half turns. 2. There is a clear "11:11" indicated by the arrangement of the 23 groups of circles. Note that the middle set of two circles is placed on a rectangular marker, apparently an area of bare dirt with random groups of plants. There are 11 groups of circles before the marker, and 11 groups after the marker. The Kundalini serpent of the chakra system is coiled into three and a half turns. It is said to be subtle cosmic energy that lies dormant in a coiled form in the muladhara chakra at the base of the spine. When the Kunalini is awakened, the energy travels upward through the chakras, in a purification process, reaching the crown chakra at the top of the head. The soul then merges into the supreme Self. This is apparent in the death masks of the ancient Egyptian Pharaohs, such as King Tut, where serpents protrude from the head. "The name Quetzalcoatl is derived from the quetzal bird of Guatemala and Mexico. The quetzal had golden-green and scarlet plumage, and was considered the most beautiful of all birds. "Quetzal" also means precious. 'Coatl' is serpent. In the Maya language, 'Kukulcan' means approximately the same thing. According to Hunbatz Men, 'Ku' is sacred, God. 'Kul' is coccyx, the base of the spine, where latent spiritual energy resides. 'Can' means serpent. 'Kukulcan' therefore is synonymous with 'kundalini' -- which is what the Kukulcan/Quetzalcoatl archetype is all about, of course. To be iconographically correct, however, the god Quetzalcoatl is not himself the feathered serpent, but the one who emerges from the serpent, just as the spirit emerges from the body through the top of the head, and the Morning Star emerges from the horizon." 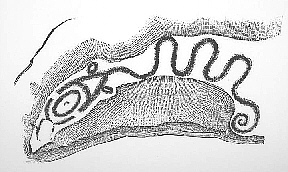 There may be a connection to Serpent Mound in Ohio. Jeffery Wilson, owner of the Independent Crop Circle Researchers’ Association [ICCRA], has led the research at Serpent Mound, and other locations in the USA. He has led conferences near Serpent Mound most years since 2003. There is a grand scale worldwide phenomenon associated with the number 11:11. People report seeing 11:11 to an extreme degree. The "11:11 coincidences" become so strong and frequent, the people feel strongly that it has a meaning, perhaps a "wake-up call." Decades ago, a lady called Solara had a visionary experiences about an "11:11 Doorway" opening in the Belt of Orion. She later wrote books on the subject. She predicted that people would starting seeing "11:11" very often, such as on digital clocks. The prediction clearly became manifest in time. Solara also wrote of the "11:11 Birdstar." "Once we know that we are One, our Unified Presence takes the form of a vast white bird. This large white bird is composed of myriad small white birds flying in formation as One. It could be termed the Merkabah or the Birdstar. It is our vehicle for mass ascension. (This Birdstar is not a spaceship. It is the expression of our Unified Presence!)" Near the beginning of August 2003, a crop formation appeared that looked like a group of birds in flight. The image certainly fit Solara's description of the "11:11 Birdstar." A friend pointed out that this "Swallows" formation looked like a Menorah when turned upside down. 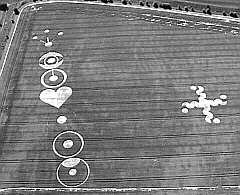 The Menorah, of course, also appeared as a crop circle formation in 1999. Clearly, the Menorah is related to the Tree of Life, and both are related to the chakra system. At the end of the film, "2010," the sequel to "2001: Space Odyssey," the earth has two suns. My feeling is that this refers to the coming duality balance that happens with the "return of the feminine." Some say this is the "end of time," or even "Doomsday." Others think it is just the end of a time cycle, and that another will begin. My years of study leads me to agree that this is the end of a grand cycle and the start of a new one, which will be very positive in the long run. A number of crop circle formations have appeared that seem to refer to the images of the Mayans and Aztecs. I find it coincidental in a meaningful way, that I was interviewed on a radio station on 1 June 2007, on the subject of "11:11" -- the day after the spiral formation was reported at Yatesbury Field, and shortly before I knew about it. Note the seven spherical nodules along the pole from near the bottom on up to the crossbeam. They are thought to correspond to the seven chakras of the human body. There is another nodule above the beam, which may represent a sphere of timeless consciousness beyond the earth plane. Note also that the composite animal's snout cuts across the pole between the third and forth nodules. The platform of the Judgment seat is also at that level. This seems to indicate the critical point between the third chakra and the fourth, the heart chakra. The baboon on the Judgment seat is one form of the god Thoth, counterpart of the Greek Hermes (Mercury to the Romans), who guides the soul after death. Baboons bark with the rising of the sun. If the heart weighs more than the feather, the dead soul is devoured by the "Swallower," the composite beast, a mixture of crocodile, hippopotamus, and lion. If the heart is found to be lighter than the feather, the soul is conducted by Thoth to Osiris's throne by the Waters of Eternal Life. Joseph Campbell wrote that in terms of the kundalini, the message could hardly be clearer . . . if the aims of the deceased in life were no higher than those of Chakra three (the animal instincts), the Swallower claims the soul. The implication is that if one has not reached the heart chakra level of love and compassion during a lifetime, the person must be reborn, that is, reincarnated back on earth, in order to try again. Otherwise, the soul is free to move on to higher planes of existence. The sand painting shows a corn plant with seven markers, which, according to Joseph Campbell, correspond to the seven chakras. From the bottom-upward, they are marked by the root, the five leaves, and the tassel. The two leaves marking the third and fourth chakras also show ears of corn. A lightning bolt from above strikes at the fourth marker, which is in the center. This corresponds, he wrote, to the vajra, "the thunderbolt of enlightenment" of Hindu and Buddhist iconography, which exactly fits with the fourth chakra, anahata, "where the sound is heard that is not made by any two things striking together." Three chambers are shown underground, connected by vertical tunnels. From the top chamber, another tunnel leads straight up to the surface of the ground. Insects are shown in the bottom chamber, animals in the middle chamber, and humans in the upper chamber. The chambers and tunnels, along with leaves at the top, resemble a large plant. A large spider with a cross on its back is depicted at several places. Near the upper chamber, various birds, a tree, and a twelve-petal sunflower are depicted inside rectangles. Seven human figures are shown climbing in the tunnel from the third chamber to the surface. A small group of humans are shown standing on the surface, with rays of light from the sun striking them. A giant rooster is also standing on the surface. The text next to the depiction tells the Hopi creation story. The Creator placed insects in the earth and told them to figure out the meaning of life. After a time, the insects still had not found the meaning, so Spider Grandmother was sent to help. She helped them move up to the next chamber, where they became animals. Again, they could not find the meaning of life, so Spider Grandmother came again, and helped them to travel up to the third chamber, where they became human beings. After more time passed by, and the humans had not figured out the meaning of life, Spider Grandmother came again, this time assisted by birds. The people climbed up to the surface, and then Spider Grandmother taught them how to weave. The three lower chambers would symbolically correspond to the first three chakras. The climb toward the surface would indicate the three and a half point, and the surface would correspond to the fourth, heart chakra. In July 2004, a crop circle formation appeared at Pewsey White Horse near Pewsey, Wiltshire. It was a cross type design. Another formation appeared about two days later, located a short distance to the side of the cross type design. It is quite clear that the second formation represents the chakra system. I felt that this was a strong confirmation of ideas that came my way over a decade prior. My personal experience with 11:11 started in 1990. By early 1993, the meaning seemed clear -- humanity has been on a time cycle path that corresponds to the chakra levels. We are near the three and a half midpoint, and a leap to the fourth level, the heart chakra. "But after the three and a half days a breath of life from God entered them, and they stood up on their feet, and great fear fell on those who saw them." This is speaking about the two olive trees, also called the two lampstands and two witnesses. They are related to the two anointed mentioned in Zechariah 3 and 4, the High Priest and governor (King). These two olive trees stand on each side of the golden lampstand with a bowl on top with seven lamps. This sounds similar to the Menorah. The High Priest and King, I believe, carries duality symbolism. Traditionally, the two are sometimes combined in a single person, as Priest/King, or Fisher King. I believe the idea is similar to the shaman and chief of various tribes of the world. The Priest/shaman is related to the right brain, the inside self, intuition, and the dream realm. The King/chief is related to the left brain, outside daytime self, associated with rational, analytical thinking. When I originally read the verses of Revelation 11, I had just read the chakra material in Joseph Campbell's book, "Inner Reaches of Outer Space." Therefore, the "three and a half days" seemed quite coincidental in a meaningful way. I also knew some of the information about Solara's 11:11 Doorway. In addition, there were strange reports about two trees. One of the events occurred in Oxfordshire in 1991. On the grounds of a private school, during a cricket match, two trees began to shake for no apparent reason. A half circle had formed next to the two trees. A full circle of about 30 feet appeared some distance away. All these connections came to mind when I first read Revelation 11:11. This, of course, does not "prove" a theory, but it certainly provided a working theory, that I intended to pursue. I began to look for a similar message from other sources as time went on, especially concerning dreams and crop circle formations. 1. Rev. 11:9 and 11:11 - 3 and 1/2 days. 2. Rev. 11:2 and 13:5 -- 42 months, 3 and 1/2 years. 3. Rev. 11:3 and 12:6 - 1260 days -- 3 and 1/2 revolutions on a 360 degree circle, or the Zodiac, or 3 and 1/2 years on the Jewish calendar, which had 30-day months. 4. Daniel 12:7 and Rev. 12:14 - "a time, two times, and half a time" -- 1 + 2 + 1/2 = 3 and 1/2. 5. James 5:17 and Luke 4:25 -- telling the story in 1 Kings about Elijah's prayer that it not rain, and it did not rain for 3 years six months. Then he prayed again, this time for rain, and Heaven gave rain, and the earth brought forth its fruit. 6. Daniel 9:27 -- "And he shall make a strong covenant with many for one week; and for half of the week he shall cause sacrifice and offering to cease; and upon the wing of abominations shall come one who makes desolate, until the decreed end is poured out on the desolator." -- half of a week is 3 1/2 days. As mentioned previously, there are 11 groups on either side of the central group of 2. This reminded me again of Revelation 11:11, because the verse is quite near the center of the Book of Revelation, which has 22 chapters. The great scholar, H.P. Blavatsky, wrote that the writer of Revelation, Saint John the Divine, was a kabbalist. For example, the Hebrew alphabet has 22 letters, and the Tree of Life has 22 paths, which are associated with the 22 cards of the major arcana of the Tarot deck. Also interesting, 11 / 3.5 = 3.142857, the same, of course, as 22 / 7. This is "near pi" or "Pyramid Pi," used by the ancients in calculations, such as the circle indicating the sublunar distance around the New Jerusalem. I am placing links below that include more information about the subjects of this article. Many people are now trying to find more meaning in the groups of circles of the Yatesbury Field Spiral. I hope that this article helps in finding more answers. Various theories were soon flying around the Internet. It may have been a errant Russian missile or made by the HARP facility in Norway. Some thought exterterrestrials were responsible. There was speculation that it was related to President Obama's speech in Norway, where he accepted the Nobel Peace Prize the day following the sky spiral event. People like extraterrestrials. A more likely explanation is that the kundalini starts to rise along what I have demonstrated to be the midline of the planet on which this event took place. Barbara also mentioned the kundalini. I have read numerous times that the kundalini is related to the Holy Spirit of the Christians. On the day it was opened on a cosmic level it is said that the whole atmosphere was filled with tremendous chaitanya (divine life force energy-vibrations) and there was tremendous light in the sky, and the whole thing came on the Earth. The description sounds quite like the recent spiral in the sky over Norway. In the direction EAST, universally acknowledged as the place of new beginnings, the Maya place the hieroglyph CHICCHAN (pronunciation: cheek'chan). 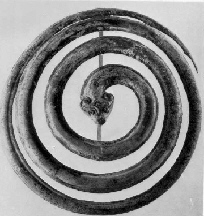 CHICCHAN is the serpent mind, the mind that is constantly renewed and regenerated, through a process of shedding what no longer serves us. The physical body itself can be seen as an evolutionary skin periodically released, as one life ends and another begins. It is a body fueled ultimately by a form of solar energy the Maya call kultunlilni. Kultunlilni is the vital life force empowering all human growth and development. This crucial life-force is the same as what is known in Hindu cosmology as the serpent power: Kundalini is the great evolutionary force making of each body and its occupant, a potentially powerful source of solar wisdom. Important for us to remember, however, is that this primary, very intimate and very powerful source of wisdom is only accessible to the extent that we are able to hear what our bodies, as carriers of its sacred gift, are actually telling us. Inevitably in this process, we turn to those with whom we feel a strong attraction or affinity. " In ancient writings of the Bible and also Gnostic records...the energy now known to many today as Kundalini energy is called by various names such as: Sophia, Life, Mother of the living or Wisdom. This force called Wisdom is likened to a feminine energy, and even a feminine personality ........ named as She and Her. In these writings the words; She...Her ...Wisdom & Holy Spirit are used interchangeably to refer to this feminine aspect of the Divine. Also later known in Christian texts as the Holy Ghost, Comforter, Counsellor and Redeemer. From the ancient Wisdom of Solomon written some 2500 years back we read: Chapter 6, Verse, 12-17: 6.12-”Wisdom is radiant and unfading and she is easily discerned (recognised) by those who love her, and is found by those who seek her. 6.13-She hastens to make herself known to those who desire her. ..... and 6.16-She goes about seeking those worthy of her, and she graciously appears to them in their paths, and meets them in every thought. And what of Sophia, of Wisdom, of the Holy Spirit, Comforter, Counsellor, Redeemer? Well people say She is here, residing within each and everyone of us as a sleeping potential, an inner life force, known widely as the Kundalini energy. This unique energy resides in the sacrum (sacred) bone. It is said that She can be awakened if one truly desires it so. It sounds like a dream but that’s what this music seeks to proclaim and celebrate. Further it is said that the one who resurrects this inner Divine Life Force, en-masse, is the Divine Mother, Goddess, Holy Spirit, who is verily a Comforter, Counsellor, Redeemer. This inner living resurrection can be enjoyed every day, and each second by those who experience it. What’s more, it is celebrated globally on the anniversary of the opening of the Sahasrara. The Sahasrara is the universal energy centre located at the crown of the head, at the fontanelle, the seventh chakra or highest centre of consciousness, known otherwise as the thousand petalled lotus. It is through this last centre that one is able to connect with the all pervading universal divine “that is”. On the day it was opened on a cosmic level it is said that the whole atmosphere was filled with tremendous chaitanya (divine life force energy-vibrations) and there was tremendous light in the sky, and the whole thing came on the Earth. Since that day, thousands upon thousands of seekers from every nation have crossed paths with the one who ‘delivers the goods’. The images of the day of the opening mentioned above, were experienced by Shri Mataji Nirmala Devi, in a meditation on May 5, 1970. It is called, the "Opening Of The Primordial Sahasrara." Recent reports tell of similar spirals in the sky over China and Russia. They pictures and videos are similar, but the sky images are not as grand and impressive. It was from a meditation on May 3, 2001. Ali ibn Abi-Talib, the seventh-century figure central to Shiite Islam, is said to have predicted when the world will end, columnist Amir Taheri points out. A "tall black man" commanding "the strongest army on earth" will take power "in the west." He will carry "a clear sign" from the third imam, Hussein. Ali says of the tall black man: "Shiites should have no doubt that he is with us." Barack Hussein in Arabic means "the blessing of Hussein." In Persian, Obama translates as "He [is] with us." Thus does the name of the presumptive American president-elect, when combined with his physical attributes and geography, suggest that the End of Times is nigh  precisely what Iranian president Mahmoud Ahmadinejad has been predicting. There have been many spiral type crop circles, of course, and other signs/symbols in the sky. As I see it, the other theories cannot account for that near perfect tight spiral in the sky. In 1992 I wrote a letter with a list of ideas about the earth changes and sent it to Pat Delgado via snail mail. He had asked his readers to send ideas that incorporated more fields of study that may be related to crop circles. My ideas were based on my experiences of intense dreams and coincidences. 28. Strange phenomena will increase and may take various forms, such as clouds forming symbolic patterns, objects raining from the sky, and spiritual apparitions. In 1992 my son had a dream of incredible events happening in the sky. People were startled and afraid. This was being controlled by some fantastic computer, and only his brother, Thomas, knew how to operate it. Some years later, I found that Thomas means "twin," and that the twin theme is a major message in the changes ahead. It seems to concern the duality, which in many mythologies is said to be in a divided state. The great change is apparently about a re-union of the duality across scales, an incredible cosmic event of some kind, that cannot be fathomed yet. About two years later, I read a report by Paul Bara of the Sussex branch of the Center For Crop Circle Studies. Paul receives communications through dreams and a type of channeling. He said that there was going to be events in the sky that will startle millions. In 1995, The Dream Network Journal published a series of issues called, "Dreaming Humanity's Path." The dreams clearly were indicating great changes ahead. A number of the dreams were about constellations, such as Orion and the Pleiades, and events in the sky. In volume 14, Numbers 1 & 2 (combined), on page 50, is a dream that starts with an earthquake. Burning KKK crosses fall on people and pieces of buildings fall. Pieces of the street are thrust up. Then it is night time and everyone is looking up at the sky. They see a strange thing, like a comet, coming slowly toward them. It is glowing and pulsating. Everyone is afraid, but the dreamer is told mentally that it is extraterrestrials who are coming to help, and save them. The dreamer knows that this is a worldwide destruction going on and that nothing will ever be the same again. But he and his companions are being saved and protected. In volume 14, number 3, on page 19, two dreams were printed side-by-side, titled "Signs in the Sky," and "More Signs in the Sky." The two dreams were submitted independently, yet they were almost identical. One dreamer saw a giant wheel turning in the sky with constellations going round and round. It was like time was turning, yet she and her friends were in a place of no time. Not everyone could see what was happening. She knew the identity of the constellations by name, old and new, and by "connected" names. She asked her friend, "Do you see THAT?" and described a sign in the sky. It was like the stars were making connections. The second dreamer was with a friend and looked in the sky with total awe. She asked, "Do you see THAT?" and described a sign in the sky. It was like the stars were making connections. She had a special name she described it by. Watching the sky signs was awesome, vivid, colorful, mesmerizing and felt prophetic. Some people saw what she saw, and others saw nothing. The wheel turned in the sky showing all the seasons and cycles. It was like looking through time, seeing past, present and portents to come. The dreamer talked to her friend a few days later. Her friend said she also had a similar vision, involving signs in the sky. There was another dream reported in the journal, which I am unable to find at the moment. I remember it quite well, so I will tell my memory of it. The dreamer was awestruck by a huge sphere with many facets in the sky. It had once been a woman in the very distant past, but had turned into this thing. It still had maternal feelings. Sometimes it came close to the earth, like near mountains inhabited by humans, and felt connections. The sphere then exploded, filling the sky with stars. (or something like that). Then, the dreamer was by a tree, and the message was communicated to her that the object/woman communicated to us through our amino acids. I recall another little coincidence in July 1990 with the same type of symbol. It started with some printouts of a spiral portion of the Mandelbrot Set. I had created the images on my old Amiga computer some time before. The two images were a combination of three pictures. On the computer, the color cycling mode could be chosen, which caused the spiral to appear flowing inward toward the center, which looked downward on the screen. I suddenly realized how symbolic this was, and started writing in my notebook. The idea I had was how a negative belief system can become a descending spiral, because of the feedback loop nature of reality creation through beliefs. I was inspired to write quite a bit about the Mandelbrot in terms of its possible symbolism. Around the same time, I read a story in "Shamanic Voices," about a tribe in South America that had a myth where a woman gave birth to a baby, and then went inside the hut where the men were drinking, along with monkeys. The woman asked, "Who is the father of this baby?" All the men claimed the baby and started pulling on the child, tearing it to pieces. All the men and all the monkeys got drunk. The monkeys chewed off their own tails. Our friend, Cliff, came in, and I started telling him the strange myth. When I got to the last part, he said, "I recently saw a picture of monkeys with big spiraling tails. Not long after, I saw a picture of the Monkey on the Nazca Plains. In my writings about the Mandelbrot spiral, I noted that the color cycling can be reversed, so that the motion is from the center outward, or upward, as I saw it. This was brought about by a little positive thinking and imagining, which had the "Butterfly Effect" of eventually getting out of the spiral pit. I noted the ratchet spiral of the 1991 Barbury Castle pictogram in the article. Dream-coincidence indicated that it represented a cycle of time through six Ages. Create the key in geometric patterning of overlapping triangles within triangles. Thus the door opens and the new spiral is made visible. I thought it was an interesting use of the word "spiral." It fit well with my ideas about the spiral. The quote is from Solara, who wrote the book, "11:11 - Inside The Doorway." It fits pretty well with the Norway sky spiral. I pictured it as a path downward in nine steps, and then back up. Many other 2005 crop formations seemed to have similar glyphs. Part of the idea comes from the Sri Yantra (see the Pollen Path link above), which indicates a path through the chakras from outward-inward. I can't be sure if the spiral in the sky in Norway has the same meaning, but it is one theory that has some background. "I must say Joseph your statement here is completely in line with my current thinking." The first part of the e-mail was about dreams, crop circles, ancient number codes and ancient sites. I mentioned a recent radio interview, where I spoke about the DNA repair and its relation to the special number 1296. No wonder crop circles appear next to or aligned with ancient sites. No wonder the mitochondrial DNA 1296 message is found at Chichen Itza in the steps of the Temple of the Warriors and the Ball Court hoop. I believe this DNA repair message is related to other messages in crop circles and dreams, which indicate an increase in the feminine attribute, or a duality balance, or the return of the feminine. There may be a clue here as to the identity of the "Circlemakers." There are many indications that the "real" crop circles (not man-made) are related to human consciousness. The cells of the plants are apparently in constant communication with all other cells, including the cells in our bodies. We humans may be creating or co-creating the formations on an unconscious level. Many are saying that we create our own reality. This may be quite literal. My research suggests that we co-create the reality each moment on an unconscious level. We will learn to be conscious co-creators, symbolized by Lion King and Royal Power. The crop circle phenomenon may be showing the way. The collective unconscious is apparently progressing in an evolutionary cycle. Symbolic messages may be progressing from the dream and inspirational sources to physical events, including UFO/ET events, meaningful coincidences, symbolic events, and crop circle formations. The Beginning of a New Phenomenon? These sky events may just be the beginning of a new phenomenon. I am thinking how the modern UFO phenomenon started in 1947, even though there were similar events in the past. Perhaps it is more of about public perception. The same could be said of the crop circles, which are said to have started in the late 1970s. The number of crop circles increased dramatically over the years. There was definitely an abrupt change in the crop circle phenomenon in 1990. 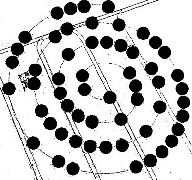 Prior to that year, all the formations were simple circles and rings. In the summer of 1990, we began to see the "pictogram" types, with rectangular boxes, pathways, and projections. They have become increasingly complex through the years. Strange things in our skies is nothing new, but these strange spectacular spirals appear to be something new. My guess is that such things will become more common as the future unfolds. It has been my opinion for a long time that UFO and ET events are symbols. 11:11 - What is the Meaning? Unbelievable Photo From Norway - Is This a Stargate? 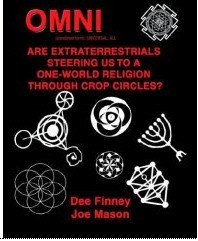 One World Religion Through Crop Circles?